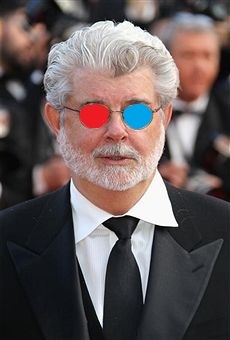 George Lucas plans to re-release the entire "Star Wars" franchise in 3D beginning in 2012, according to both Variety and the Hollywood Reporter. 20th Century Fox released all six of the original "Star Wars" films and would release the 3D conversions as well. The ambitious plan will start with "Episode 1: The Phantom Menace," followed in order by the rest of the series, with one film coming out each year. That means that the original "Star Wars" wouldn't debut until 2015, which could be too late if the last three films underperform at the box office. It's unclear when during the calendar year the films would be released, but a Lucasfilm spokesperson told Variety that each movie will open wide and "as close to day and date (worldwide) as possible." In the words of old Ben Kenobi, "I felt a great disturbance in the Force, as if millions of voices suddenly cried out in terror and were suddenly silenced. I fear something terrible has happened."